Investigative journalism is, at the best of times, a lonely and thankless job. Trawling through company reports and directors' listings, meeting dodgy characters in dangerous locations and leeching bank statements and deposit slips whilst trying to link all of this with the subject matter takes a lot of patience, girded loins and clarity of thought. South Africa has a rich history of investigative journalists, including the Rand Daily Mail team who exposed the Information Scandal in the late 1970s and the Vrye Weekblad crew (relaunching today, incidentally) who exposed apartheid's hit squads in the 1980s. Former president Jacob Zuma's lost decade of state capture, grand corruption and maladministration has certainly given the country's current crop of muckrakers more than enough crap to dig into, with painstaking forensic investigations becoming the norm. Journalists from amaBhungane, Daily Maverick, News24, the Mail & Guardian and other publications have all waded into this murky world with success over the last decade, exposing illegal dealings, criminality and theft. 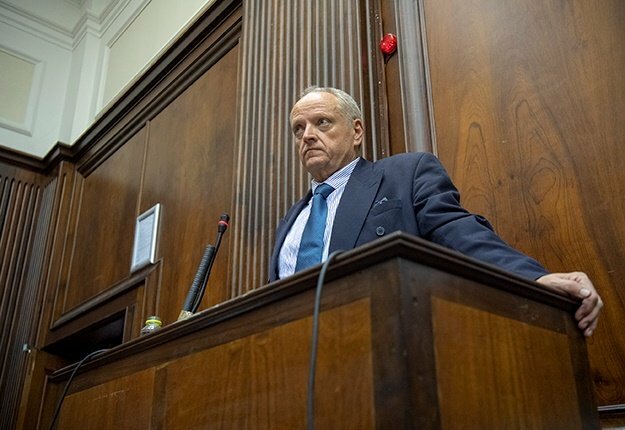 It is in this crowded field that Pieter-Louis Myburgh released Gangster State: Unravelling Ace Magashule's Web of Capture. Myburgh, a former journalist at Rapport and News24 and now with Daily Maverick, spent more than a year researching the empire that Magashule built in the Free State before being elevated to arguably the second most powerful position in the ANC, that of secretary general. 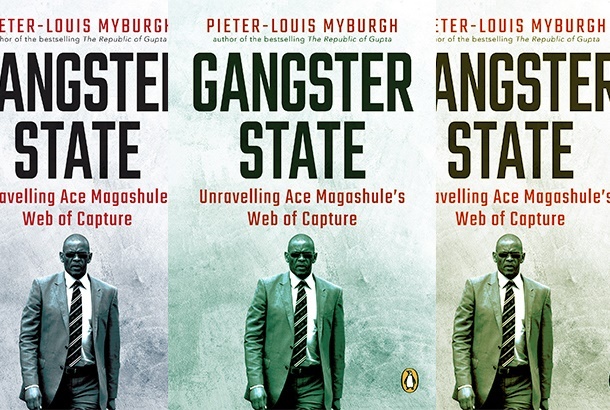 Gangster State is a meticulous and thorough examination of Magashule's world in which Myburgh combines documentary evidence with first-person accounts of the former Free State premier's networks, confidantes and arrangements. The book is published at a most opportune time as well, giving the ANC the opportunity to demonstrate its stated commitment to rooting out corruption ahead of an important election, one in which the corruption of ANC leaders is a major election issue. The value in Myburgh's book is in his description and analysis of how the Magashule eco-system works (because apparently his move from Free State House to Luthuli House has done little to diminish his influence in the province). You won't find Magashule's fingerprints on an EFT transfer or a chain of WhatsApp messages demanding 10% from a tender that was just issued. But you will find a network of acolytes and hangers-on – 'blessees', even – who moved in Magashule's orbit and who benefitted from provincial contracts. It is this crowd that, according to Myburgh's book, did the dirty work for "Mr Ten Percent" (so called because that is seemingly his cut from big tenders). Some of the most riveting chapters are the those that deal with the travails of Igo Mpambani, a slick Welkomite who made it big thanks to his connection to Magashule. Mpambani was gunned down in broad daylight in Sandton in June 2017 while driving his gleaming Bentley. But what made this murder interesting was that the car was carrying almost a million rand in cash, and that by the time of his death Mpambani pretty much acted as Magashule's bagman. Mpambani and his partner, Edwin Sodi, scored a neat contract of more than R255m to do an audit on behalf of the provincial government to determine how many RDP houses had asbestos in the ceilings. But their company, set up specifically to manage this project, did not have the skills or capabilities to do the work. Instead they subcontracted it for R21m (and based on Myburgh's investigations, a grossly exorbitant fee) and pocketed a cool R230m. As grotesque as it might seem, a tender of R255m won't even feature in South Africa's corruption hall of fame. In this case however, Myburgh is able to forensically show how Mpambani used the proceeds of his labour to the benefit of Magashule and the governing party. And he is even able to make the links directly to Magashule's office in Bloemfontein. Whilst R255m, when compared to the Guptas, might seem small, this contract helps the reader understand how the capture network in Magashule's Free State functioned, how it disbursed money and how the former premier's demands were communicated. Myburgh, author of the bestselling Republic of Gupta, was able to take a year out from his day job thanks to a grant from the Taco Kuiper Foundation, something which he hopes other investigative journalists will also consider. The result is a deep dive into Magashule's embellished record as a "struggle hero", his early days as a powerbroker in the province, his many clashes with Mosioua Lekota and Beatrice Marshoff (both whom he succeeded as premier) and his bizarre sense of entitlement to state-owned cattle at the Glen Agricultural College outside of the provincial capital. Gangster State takes the many allegations of corruption levelled against Magashule over the years, unearths new allegations – and importantly, documentary evidence – and describes an arrogant and dangerous political leader who has not hesitated to manipulate and gerrymander to get what he wants. This book has seemingly not been read by anyone inside the ANC, who have tried its collective best to bury their heads in the sand. Magashule has strong support across the board in the party and won't be felled easily. But even if the ANC does not read it, it surely should be of great interest to Shamila Batohi, the national director of public prosecutions. Gangster State could easily serve as the basis of a charge sheet or a police docket. Along with Crispian Olver's How to steal a city, Gangster State gives the public graphic insight into the anatomy of corruption and capture. Myburgh's book will be tested. I suspect he wants nothing less.